When there is talk about medical errors, we tend to shine the spotlight on the mistakes doctors or the medical staff make. However, the truth is that patients often make mistakes as well. There are a number of reasons for these mistakes. For example, a patient has been prescribed 0.2 ml of Lupride, and she ends-up taking 2 ml by mistake; this was because she didn’t understand what the decimal point meant. Mistakes such as these are upsetting and irritating for both, the patient and the doctor. The patient is scared that in taking more than the recommended dose, she is harming her health or that she may have to cancel the cycle because she has messed up her medications. The doctor is irritated, because he feels that he did an excellent job with giving all the right instructions and explaining how the medicine has to be taken; if she didn’t understand, why didn’t she simply ask him for clarification and cross-check with him, rather than pretending to understand? Doctors sometimes forget that patients can be quite intimidated by them! 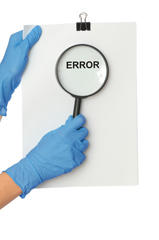 Why Do Patients Cover-Up Their Mistakes? It’s important to understand that all of us make mistakes and being charitable and understanding is the best way to move beyond the situation- after all, a goof-up is a goof-up and its not been done deliberately. Rather than start assuming that all patients are idiots, these mistakes can prove to be ideal learning opportunities. The fact is that patients make mistakes more often than we realize. They cover up these mistakes because they are scared it will upset the doctor and get him angry and that he will admonish them for the slip up. If patient has enough confidence in the doctor, she will let him know when she made a mistake; then it's up to him to resolve it. Sometimes these are not much more than minor issues, which can be safely ignored. Of course there are times when these mistakes can create major problems; however, these too can be tackled only if the patient is willing to confide in her doctor. Interestingly, sometimes these mistakes can be serendipitous events, which can actually help to advance medical science! For instance, if the patient takes a lower dose than the one prescribed, and still has a good therapeutic response, the doctor might just start prescribing the lower dose to all his patients, because it may be as effective as the standard recommended dose. This is especially true when patients are taking alternative medicines. They will often hide this information from their doctor, because they are scared he may get upset with them for doing non-standard treatment. However, if they get better and share this information, the doctor can learn from their experience, if he is willing to keep an open mind. Maybe he can even start advising other patients to try out alternative medicines! Patient education can play a very important role in reducing the errors which patients inadvertently make; and it's important that doctors and hospitals invest in tools and techniques that will help patients become better informed. Need more information about how you can mimimise making mistakes ? Please send me your medical details by filling in the form at www.drmalpani.com/free-second-opinion so that I can guide you better!